CES 2018 has transformed from a show focusing on “consumer electronics products” to “intelligent consumer mobility” solutions powering next generation connected experiences for personal communication to home to transportation. (see here, here , here and here). The “mobility” piece of the all new connected world has been developing into a very interesting, lucrative segment for the entire tech industry. This segment is already a trillions of dollars in opportunity to power end-to-end personal or shared mobility experiences via different modes of transportation, software, connectivity, advertising or services. The location is the glue which drives these experiences and whcih we have been analyzing via our in-depth “location ecosystems” research (see here, here and here). Players such as HERE, Google, TomTom, Mapbox and others are driving these ecosystems from location perspective. However, as we have highlighted before, a horizontal open platform model like HERE’s OLP initiative is key to drive the “mobility ecosystem” forward powering newer end-to-end friction-less connected experiences. In light of this, HERE at CES 2018 announced its latest horizontal platform play “HERE Mobility Marketplace” and related services on top of this to enable a global-scale open and neutral platform play to connect the demand and supply-side players and offer a seamless end-to-end mobility planning and realization experiences for both sides. This comes from an entirely new business unit at HERE – “HERE Mobility” alongside HERE IoT and HERE Automotive. Below are a few thoughts on how disruptive this announcement is and how it can potentially end the siloed, closed mobility experiences and monopoly practices for demand-side & supply-side. HERE Mobility Marketplace from the newest HERE’s Mobility division is a natural extension to HERE’s Location Platform-as-a-Service cloud offering. Majority of the “mobility” experiences today are quite siloed, fragmented and thus broken in this very app-centric world. The Marketplace thus creates multitude of opportunities and options for all the stakeholders in generating as well as spreading the value. 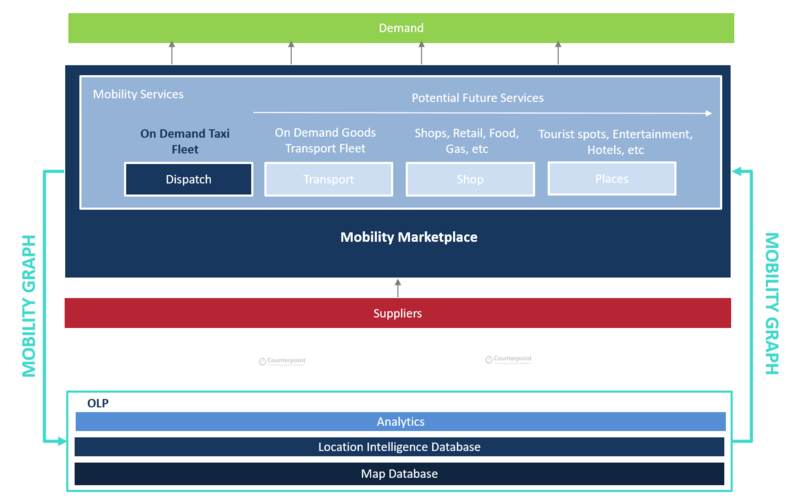 Above all, more the HERE Mobility services can help plan and power the end-to-end customer “mobility journey”, it will help HERE form its “Mobility Graph” similar to Google’s Knowledge Graph or Facebook’s Social Graph or Amazon’s Commerce Graph. The Marketplace can finally drive monetization opportunities for HERE via different monetization models from # of API calls, revenue share, premium predictive analytics service which can optimize mobility itinerary to save $$ in costs and more. For the suppliers – HERE has designed the platform to make a very easy on-board process to set the configuration. Becoming a marketplace, there will be opportunities for HERE to monetize with “Sponsored Suppliers” like on Amazon Marketplace though transparency with suppliers and fair algorithmic rankings will be important to maintain the neutral, open and transparent stand by HERE and possibly use subtly and not be the only major monetization model. However, this could be a great opportunity for smaller suppliers for example competing with likes of uber or lyft to gain visibility within the marketplace. Further, while platform is open and HERE sees itself actually as a competition enabler forming this marketplace platform connecting the unconnected, HERE will have to have tighter policies to ensure the platform is free from any unfair pricing or monopolistic practices or meeting the QoS (Quality of Service) via Supplier as well as Demand side Ratings model. In summary, this marketplace model which have been tried by many in different industries but only few succeed, however, in location or mobility ecosystem, HERE has unique advantages to lead and drive this initiative due to its neutral positioning of its solutions, leadership position in this space, early market lead or first mover’s advantage, expanding customer rolodex, growing investor base and above all the breadth and depth content and technology to power this platform. At this point, it looks difficult any of its competitors are taking a similar disruptive approach from Google (heavy inertia in Android and advertising – seen as a less neutral partner), Apple (very vertical not interested in horizontal play), TomTom (a bit struggling with heavy dependence on legacy business and hardware) and then a longer tail of smaller players difficult to reach the position of scale and capabilities where HERE is at. This is one of the opportunities for HERE to build the “Mobility Graph” of the world while monetizing with an open partnership model connecting demand and supply.